Claim up to £/€/$700 welcoming bonus Play Now! Highlander is a 1986 cult classic movie that starred Sean Connery and Christopher Lambert. The story involved an immortal Scottish warrior embarking on fantastical adventures, so it was always going to be an interesting option to be developed as a slot game. In this case, Microgaming casino sites have benefitted from releasing the Highlander slot. A stark landscape with dark skies is presented as the backdrop from the Highlander slot. In front of that, players will notice that Highlander is a slot with five reels and three rows, thus allowing for 15 symbols to land in the game. There is a strong sense of scale in Highlander, given that there are 243 ways of winning. 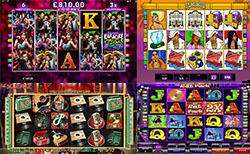 Some slot games are likely to have set paylines, whereas ways of winning only requires for players to match up symbols in successive reels, rather than a specified order of positions. In order to play, you will need to click or tap on the betting area of the screen. This allows for a coin size of €0.01 to €2.00, while the volume of coins can go from one to 15. Therefore, Highlander can start from a minimum €2.00 bet and the largest stake can be €30.00. • Wilds: Use these symbols in order to substitute for absent symbols. • Scatters: Getting two scatters will result in these being transformed into wilds. • Free spins: Scatters become even more important when three or more appear, as these can lead to 10 free spins being credited. • Quickening Wilds: This uniquely designed feature is one that can cause lightning to strike and transform standard symbols into wilds for the latest spin. Highlander is a fun slot for movie fans to play at Microgaming casinos, but there are other good reasons for spending some time with this game. The 96.23% return to player is a great place to start, with the slot having some rewarding symbols to align, while the special features include free spins, wilds, and Quickening Wilds.